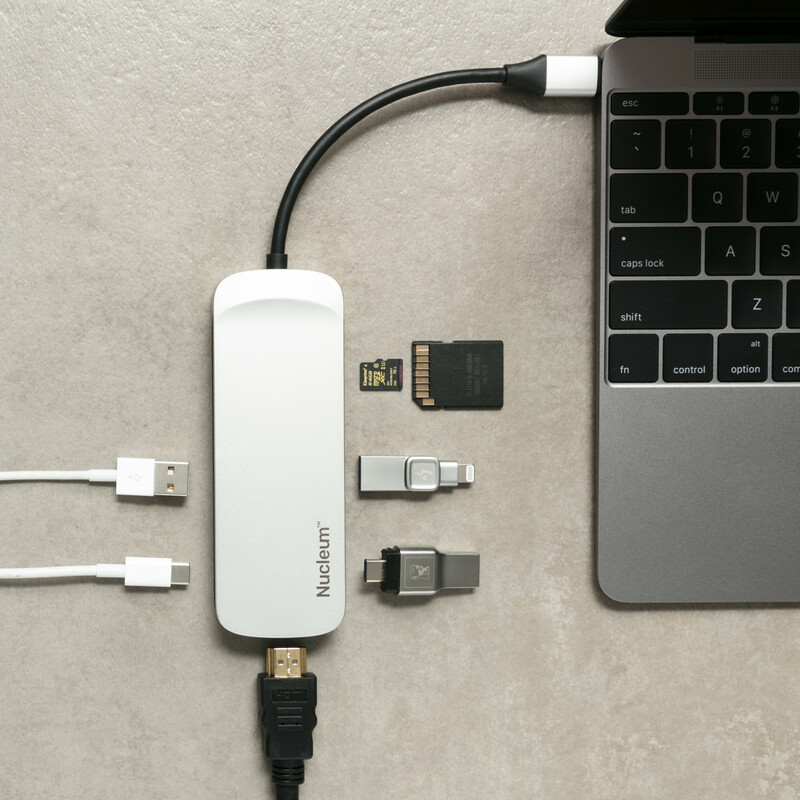 At CES 2018 Kingston introduced Nucleum which can give you the ability to run 7 devices from a one USB-C port on your MacBook. See photo 1. It is important to note that Nucleum will give you extra ports on any computer that has a USB-C port. However if it is used with a PC you will not be able to do video out from the Nucleum port. If your MacBook only has one USB-C port that is also used for charging, the Nucleum has a charging port that will charge your computer at the same time Nucleum’s other ports are running all your other accessories. USB-A - USB 3.1 Gen 1 port allows you to plug in your keyboard, mouse, and USB drive to your MacBook or PC. The port will also charge your phone. USB-C (Power) - plug in your MacBook power adapter to keep the battery charged while using the Nucleum and all of its ports (for power only). USB-C (Data) - this port allows you to transfer your data, charge your phone, or use any of your USB-C accessories (video and USB Power Delivery (PD) is not supported through this port). SD and microSD Slots - insert your SD or microSD card to the Nucleum to copy, move, or edit your pictures and documents. HDMI - mirror or extend your screen by plugging your extra monitor to the HDMI port on your Nucleum. It allows you to stream 4K video.